Plant life is easily taken for granted by much of Earth’s animal life. But, for a moment, consider all of the utility animals derive from plants: oxygen, carbon dioxide consumption, water filtration, shade, shelter, food and aesthetic beauty just to name a few. These benefits elevate the protection of plant life from a romantic pursuit by a handful of environmentalists to a key survival measure for future generations. In 2010, Duke University’s Nicholas School of the Environment outlined an ambitious plan to safeguard 60 percent of the Earth’s plant species by protecting only 17 percent of its land surface.This lofty goal is becoming more and more of a reality thanks to the combined powers of Duke University, North Carolina State University and Microsoft Research laboratories. How can they ensure the protection of 2/3 of our plant species while only paying attention to such a small percentage of the planet? "To achieve these goals, we need to protect more land, on average, than we currently do, and much more in key places such as Madagascar, New Guinea and Ecuador. Our study identifies regions of importance. The logical - and very challenging - next step will be to make tactical local decisions within those regions to secure the most critical land for conservation." 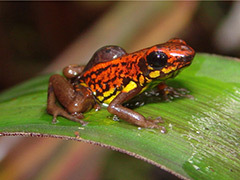 "Species endemic to small geographical ranges are at a much higher risk of being threatened or endangered than those with large ranges," added Lucas N. Joppa, a conservation scientist at Microsoft Research's Computational Science Laboratory in Cambridge, U.K. "We combined regions to maximize the numbers of species in the minimal area. With that information, we can more accurately evaluate each region's relative importance for conservation, and assess international priorities accordingly." Posted on September 11th under Global Ecology.